Me, I’m the master of the split infinitive, can’t spell ‘receive’ and still sometimes get confused about when to put full stops inside brackets, but other than that, my editor doesn’t have to waste much biro ink on me. Or should that be Biro ink? However, while I’m as exercised as anyone by signs like ‘Potato’s £1’ I try to remember that the English language is in a constant state of flux, and if it wasn’t it would be a dead language, so I’ll accept ‘train station’ for ‘railway station’ and even ‘bored of’ instead of ‘bored with’. Lately however, all kinds of grammatical peculiarities have been slipping into newspapers, and all I can think is that some writers don’t understand the fundamentals of grammar at all. Of course there are other writers who are erudite enough to have a little fun with language; how else can I explain Guardian writer Marina Hyde’s attempts to get ‘vagocracy’ into a headline? And surely that suggests the root word would be ‘vagona’? Lady Guest: Isn’t it funny that your husband and maid should both suffer accidents on the same day? Hostess: Yes, if that sort of thing amuses you. The clue here being the double-use of the word ‘funny’ coupled with the hostess’s dislike of her guest – but if you have to explain such things they lose their power. I love understated English expressions, from ‘helping the police with their enquiries” (ie arrested) to ‘sweating’ onions, to the use of ‘exercised’ meaning angered by. Dickens’ works are packed with lovely sidelong glances at language, and there’s a terrific book (back via Print On Demand) called ‘The Violent Effigy: A Study of Dicken’s Imagination’ by John Carey that anyone interesting in writing really should read. Perhaps few of us are so analytical to see how we play with words, but certain stylistic tics and tropes emerge from writers. My pal Porl in Leeds uses classically Northern language. When I pointed out that regular reader Snowy was making Bryant & May Christmas cards, he sent a picture of his own Bryant & May bookmark with the caption; ‘Coming next, the Bryant & May wrought-iron silhouette trivet’. Northern phrasing often relies on unappropriate pairings. When Victoria Wood wrote about attracting someone’s attention in a canteen she wrote, ‘I tapped her on the cleavage with a pastry fork’. The line is funny because she sees fit to describe the type of fork in use. Interesting writing is what ultimately decides whether a book stays on my shelves. Very few flatly written novels remain, no matter how ingenious their plots are. In this sense the ultimate enemy should be Dan Brown, whose prose is simply a series of simple bolted-together words used to describe an action at its most basic level. But this is an entirely legitimate tool in the arsenal, and requires talent to use correctly (and Mr Brown is certainly clever enough to have made more money that any of us). The moral? It all starts with the language. The T-shirt, by the way, says ‘Talk Proper’ on the back. I love BLIMEY! always have and still use it, much to amusement of those around me. I always get a few laughs when is use the term. I still periodically, and without affectation, involuntarily express surprise with a cor blimey. P.S. Frequently followed with an ‘ang about! RE: Blimey; I try to limit my use of local (Nottingham) dialect, but the occasional “Bleddy ‘ell” gets though. > P.S. Frequently followed with an ‘ang about! Followed by: “‘ere Love, come an’ ‘ave a butcher’s at this”. The whole thing sounds like the start of a conversation from our house. I’m originally from Brighton, well Hove actually, but I’ve lived in London so long that I now sound like what my mother used to describe as a Gor-Blimey Londoner. I blame ‘er indoors, who hails from Grin-Itch. > The T-shirt, by the way, says ‘Talk Proper’ on the back. If you were in Staffordshire it would have to say “Tow Crate”. Things change and language changes with it. The difference between “fewer” and “less” is a battle already lost and I fear that “tired of” and “bored with” are going the same way. The on-line media have contributed greatly to this and the few younger people who try to raise the bar are having a hard time. Hrumph, hrumph. 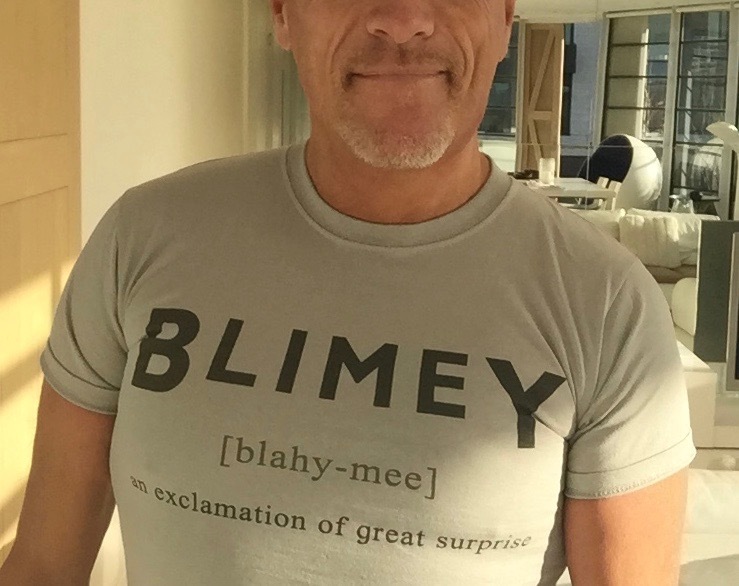 ‘Blimey’ is a shortening of ‘God blind me!’, designed to be spoken in polite company so as not to use God as a swear word. Hence the older version ‘Gor (or Cor) blimey!’. Being a northerner I’ve never understood the description of ‘Cor blimey trousers’ as sung in ‘My Old Man’s a Dustman’. Why does everyone use the transatlantic ‘get’ in restaurants etc rather than ‘have’? Also I heard someone a while ago who thought it appropriate to address a shop assistant with ‘Thanks, fella’. Maybe a sign of the language evolving into downright rudeness.And don’t start me on upward inflections at the end of every statement or indeed a heavy reliance on ‘like’ when the store of vocabulary runs low. I have never worked in a restaurant, but if I ever did and somebody were to ask me if they could ‘get’ something; I wouldn’t know quite what to say. Oh, Helen, ‘fewer’ and ‘less’ – I keep shouting ‘fewer’ at the radio and TV but sadly, they take no notice….And the one which makes me spit too these days is that somehow every sentence begins ‘So..’ In my south London home in the 50’s it was forbidden to say ‘Blimey’ because you were asking God to blind you. I could go on and on….and probably will in my head now! I’m beginning to think that a lack of clarity in our own enunciation combined with a build up of fury against media ignoramuses is what gets old people a bad reputation in seniors’ homes. Well, I’ll drink to being an old person with a bad reputation:)! I was just reading some comments about houses with too many books (there is no such thing of course until you have to move them) and someone complained about realise spelled with an s instead of z. I just had to point out that there are alternate spellings for a number of words, realise being one of them, and directing him to this blog since he also cited Ye Olde as typical of English spelling. While we are on the subject – does anyone know whether the pronunciation of ‘suit’ as ‘soot’ is an Americanism (albeit a very old one). Some people do still say ‘syoot’ (including me) but I have been chortled at up here in the North. This has bugged me for quite some time. The more often you repeat a word the harder it is to hear it properly. I’ve tried saying suit both ways and decided that I am more likely to say ‘soot’ than not, but I do sometimes put the extra sound in. Don’t ask me the source. For some arcane reason, Anne, I think it used to be thought non-U to pronounce ‘suit’ as ‘syoot’ if it was something a woman wore – it had to be ‘soot’. But if were talking about whether something actually suited you, it was pronounced ‘syoot’. When I think about it, it all seems slightly mad now, but was just something that you absorbed and never did think about. We’ll be into ‘looking glass’ for ‘mirror’ and ‘writing paper’ not ‘notepaper’, before we know where we are, if we (I) continue on these lines, though. I say ‘blimey’ and ‘crikey’ all the time. Particularly as am in constant state of surprise at things. Love the idea of the Bryant and May trivet. Surely room here for many a commemorative gewgaw (pronounced with hard G). Also would put ‘Our Mutual Friend’ above ‘Great Expectations’. Don’t know why I specified as woman’s suit. It went for men’s too. It is a hodge-podge of: *deep breath* Celtic, Norse, Saxon, Norman French, Breton, Latin and a few others that I forget. Now throw in words ‘borrowed’ from Urdu, Hindi, Zulu, Arabic and dozens more from areas that were colonised..
Coming from an area where accents are localised to a thousand mile area it’s interesting to learn about a place where 30 miles might limit an accent. We have so many immigrants that the variety of national accents gives us diversity and we’ll pretend that generational ones don’t exist. (Will they turn into seniors still saying y’know and such?) Our linguists claim they can tell where we were born and who our parents are but it takes a lot of fine tuning to the ear.